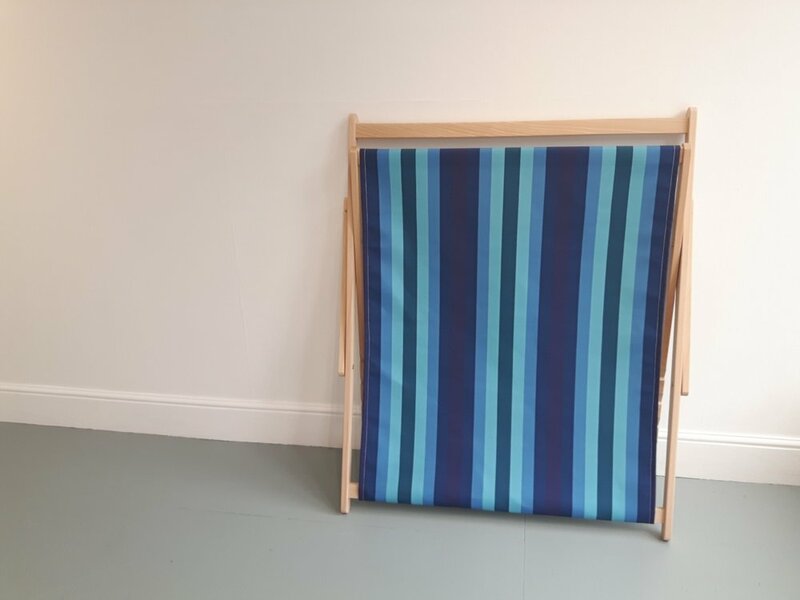 Double Deckchair, 2018, wooden deckchair with fabric sling, H1300 x W990mm. During peak season, at the height of summer, local companies capitalise on visiting tourists by offering traditional wooden deckchairs to rent at the British seaside. During the offseason, these deckchairs are left piled up, waiting for a warm day. Relocated so far from the beach, this double deckchair also lacks purpose but holds as much potential for interaction as those left vacant by the sea. Having once been denied the pleasure of renting one on a family holiday, this deckchair has been propped up against the gallery wall in a similar act of denial. The stripped pattern comes directly from My Brothers Towel, 2018, which represents gaining access to a space as an adult that was always denied as a child. This ambiguous promise of interaction questions our right of access, which, for the wider transgender community, represents often being denied career development opportunities, healthcare and personal safety.